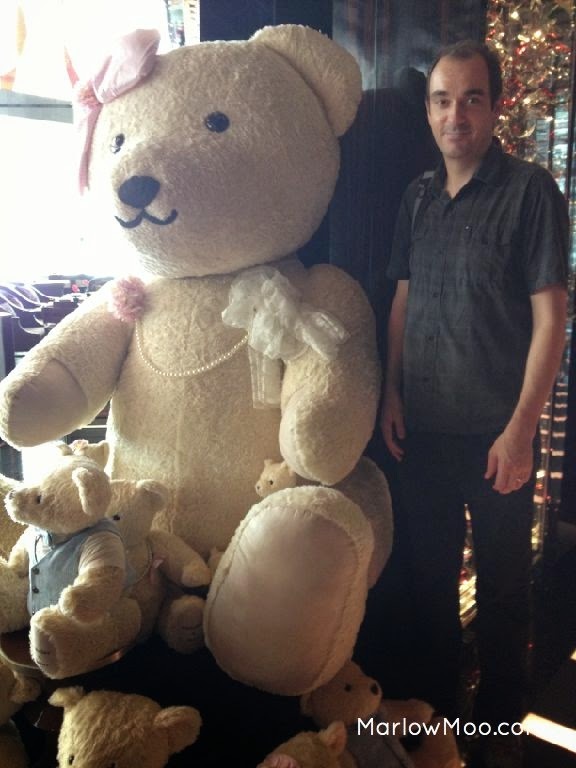 Lots of Teddys, some gigantic! During our visit, the Teddy Bear afternoon tea was occurring, being a faux fur myself, I figured I would give it a whirl. A giant teddy bear that was bigger than my male human greeted us at the door to the tea room. They had a variety of smaller teddy bears of various sizes surrounding it, as well as scattered about the room. The room itself is spectacular, with floor to ceiling windows so you have an unobstructed view of the Hong Kong skyline. 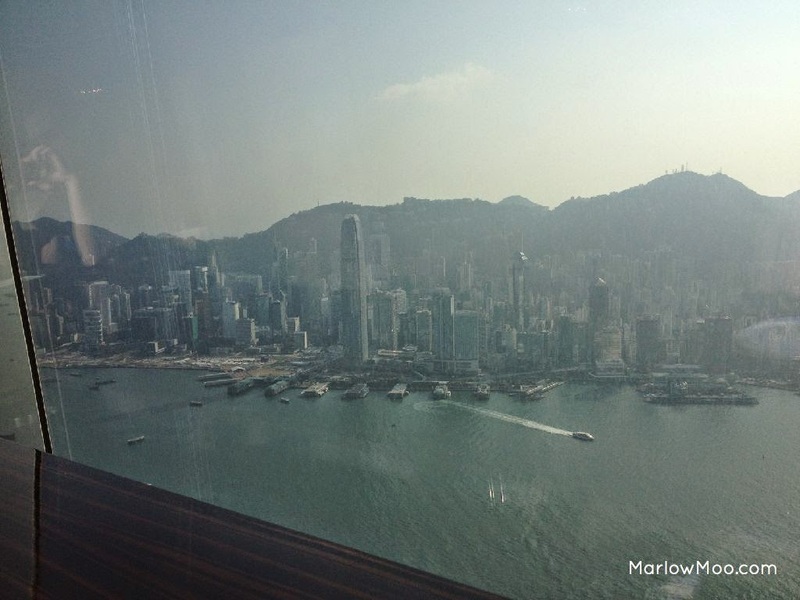 We were shown to a couch facing a window, overlooking the water and Hong Kong Island. Although it was the most unusual dining furniture I’d experienced to date, it was also a bit awkward given how small I was. The female human also had trouble with dining on a couch, as the seat was low, but the dining table was chest height for her. Also the table was a bit too far from the couch, so both humans had to awkwardly sit on the edge of the couch in order for the table to be useful for dining from. For the Teddy Bear afternoon tea, there seemed to be a focus on sweet items over savoury items, as there significantly more desserts listed than anything else. Instead of serving traditional finger sandwiches, they served Swiss rolls, otherwise known as pinwheel sandwiches in Canada. Unfortunately the bread on the Swiss rolls were extremely dry. Although there were three types of sandwiches listed on the Teddy Bear afternoon tea menu, a sundried tomato cream cheese Swiss roll, a smoked salmon mousse Swiss roll and a Sakura Zuke cream Swiss roll, we only received two out of the three types of Swiss rolls. The plain and raison scones were the daintiest looking scones we had seen to date, and like other afternoon tea places we had experience in Hong Kong, they were chintzy on the clotted cream and belberry jam. The clotted cream tasted thin, more like a cross between clotted cream and whip cream, with hardly enough for all the mediocre scones given us. The belberry jam (as listed on the menu – no flavor was indicated), was too intensely flavoured of oranges, and the large fruit chunks made it difficult to spread on such small scones. Seeing as the star of any afternoon tea in my opinion should be the scones and clotted cream, the Teddy Bear afternoon tea was failing miserably. The cashew nut bear macaroons (Yes – it said macaroons, not macaron as it ought to on the menu) although cute, shaped into the head of a teddy bear were texturally unpleasant, crunchy and dry inside and out. The shortbread had the same moisture issue and was excessively hard, making it incredibly difficult to take a bite, almost to the point of painful when I finally managed to bite into it. The most enjoyable dessert was the plain cupcakes, which seemed to be made of angel food cake and wasn’t too sweet, while the raspberry cupcake were filled with overly sweet fruit. What struck me as a bit odd was they utilized tea bags instead of loose leaf tea like other restaurants we had been previously in Hong Kong and London that offered afternoon tea. Served in a teapot that seemed too large for the size of the tea bag, it wasn’t surprising that the flavour of the tea wasn’t very strong. Not to mention when we asked for more tea, they simply added more hot water without replacing the tea bag, further diluting the taste of the tea. With the Teddy Bear afternoon tea, we were each given a Steiff bear like the ones that adorned the tea room. Although $448 HKD per person is only $64 CAD per person, it might not seem like that much money given the view and the bears that we received. However, given the poor quality of the food and the tea, you’re better off spending that kind of money elsewhere on a much nicer meal. Although it really is a spectacular view, the subpar afternoon tea experience at Ritz Carlton Hong Kong will make you wish you’d spent your time and money on a more satisfying meal. 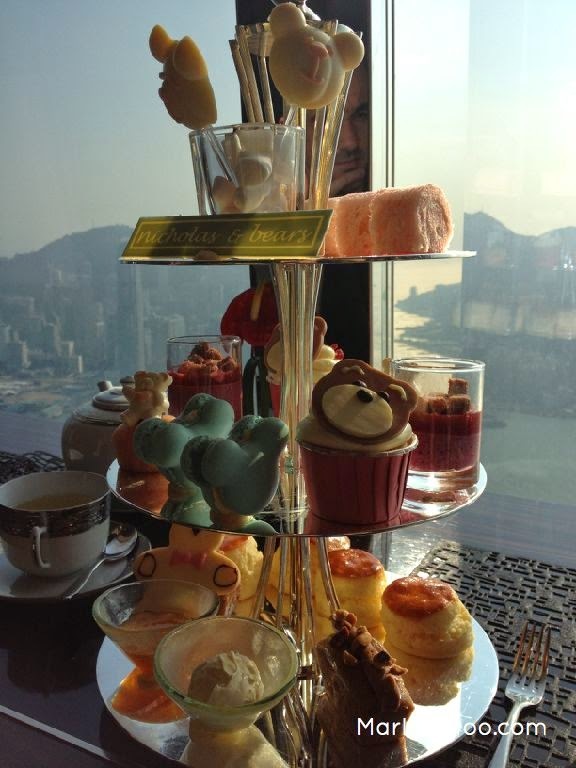 Give the afternoon tea at Ritz Carlton Hong Kong a pass and seek sustenance elsewhere.